I had a few students help me. We started off with a ply wood skeleton, surrounded it with paper and tape, and then used paper mache. 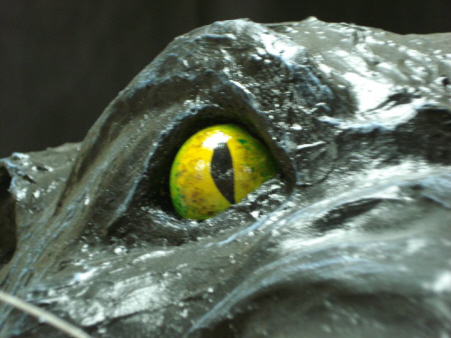 I needed it to be fairly sturdy so we used paper mache clay and then a layer of joint compound to create the fur.Â Next,Â we used a layer of Elmer’s glue to stabilize the compound. Finally, it was time to paint. I used wooden spheres for the eyes and floral wire for the whiskers. It was a challenging task, but very fun. I believe that Cory and his students used my paperÂ mache elephant video, which they found on YouTube, as a starting point for this project. If you watch the video you can see how a plywood armature can be made for a large project like this. If you look closely at the photos above, you can see the fur texture, and wonderful detailing of the main muscles. 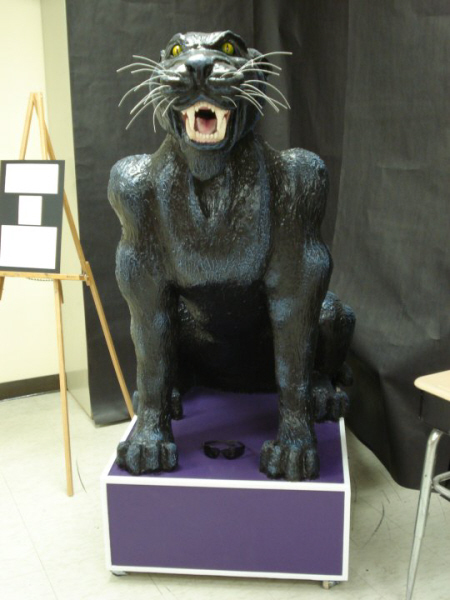 This is truly a school mascot to be proud of. “pounce on the patriots” so I hope it turns out good. 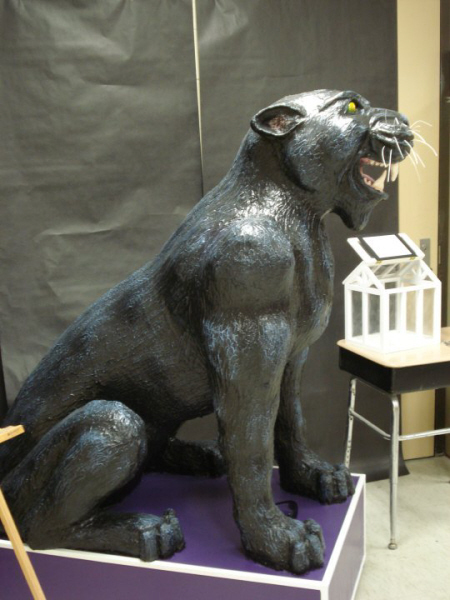 I do have one question, how did u draw the panther out? I followed the basic idea from Jonni’s youtube video. Good luck, have fun and please post pictures when you finish! I’m not sure Cory is still watching this page, so he might not see your comment. 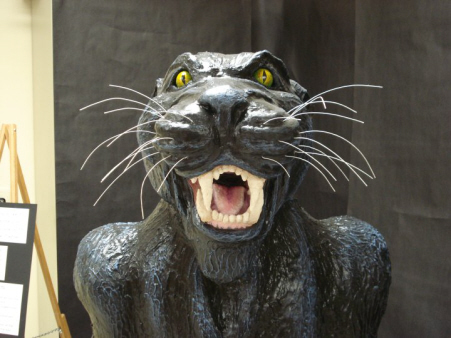 However, you can find a lot of tutorials with different ideas about how to made armatures for various kinds of animals (no panthers, though) by clicking the link to the Tutorial page or searching for “tutorial.” Any technique that works for any kind of animal will work just as well for a panther. Using a cardboard pattern, like I did in the echidna tutorial, is the easiest way to go. Good luck – I hope your project works out great. That is really something else. Amazing work. I tried 3 different techniques with the teeth, to see which I liked best. The front teeth were made from whittled from wood. The 4 larger teeth were made of rolled up news paper and tape. The back were made of sculpy clay. After all the teeth were in place I added a layer or two of plaster guaze because “little hands” find their way to the mouth. The panther is just fantastic! Wondering how the teeth were done?